PREREQUISITES: None. This course is 100% OSHA approved. Are you required to enter confined spaces? Do you work as an attendant in a confined space job? Do you work in sumps, pits, pipes, tanks, silos, or tunnels at your job? Do you conduct work in or enter permit-required confined spaces? Then, you are required to take this course! Our online OSHA confined space training course is designed to comply with OSHA’s standard for confined spaces and safety procedures, Title 29 Code of Federal Regulations Part 1910.146 “Permit-Required Confined Spaces,” which contains the requirements for practices and procedures to protect employees in general industry from the hazards of entry into permit-required confined spaces (i.e., permit spaces). The OSHA Confined Space standard requires employers to develop a written confined space entry permit program and provide employee training in confined space safety. According to OSHA, many workplaces contain spaces that are considered “confined” because their configurations hinder the activities of employees who work in them. A confined space has limited or restricted means for entry or exit, and it is not designed for continuous employee occupancy. Confined spaces include vaults, tanks, storage bins, manholes, pits, silos, process vessels, and pipelines. Employees who may enter confined spaces with potential hazards are required to receive OSHA confined space safety training. 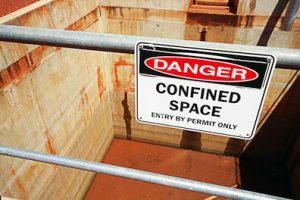 Identify what types of areas are confined spaces, including permit-required confined spaces and non-permit spaces, and to define each term. Identify the hazards commonly found in confined spaces, including atmospheric hazards and physical hazards. Identify the roles and responsibilities of the Entrant and Attendant as defined by OSHA for various personnel during confined space operations. Understand the use and need for a confined space permit. Understand basic emergency activities during a confined space emergency, including the hierarchy of rescue. Students may have to complete review sections along the way and a final exam at the end of the course. You will need a computer, cell phone, or iPad with Internet access and an email account. All course materials are available within the confined space safety training course. This is a PowerPoint with audio presentation and will take approximately 2 hours to complete. Any employee who may need to work in a confined space is required to have some level of confined space training. Whether you are a firefighter, construction worker, maintenance technician, or an emergency responder, it is important that you comply with OSHA’s confined space standards to maximize safety for you and those around you. At Hazmat School, we proudly offer an in-depth confined space safety training course that will cover all the principles related to working in confined spaces in order to reduce workplace injuries, fines, and citations. After completion, you will feel confident that you and your team will be able to apply course knowledge to everyday on-the-job experiences. To enroll in our OSHA confined space training course, give us a call at 877-OSHA-NOW (674-2669) or send us a message. We look forward to hearing from you soon!